You must get out your spiralizer now and make this delicious zoodles (zucchini noodles) dish today. 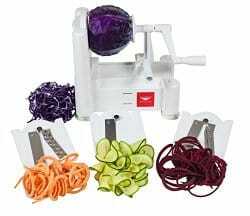 If you do not own a spiralizer then let this be the recipe that pushes you to finally buy one. Also, just in case you opt out on buying a spiralizer, you can chop the zucchini and sautee as well. The main goal here, to temp you to make this combination of flavors that is simply phenomenal. Have I convinced you yet? Just look at that picture and imagine your fork diving into the sauteed zucchini topped with corn, bacon and that cilantro lime dressing pouring down all over. The cilantro lime sauce truly elevates this simplistic dish to a flavor combination of pure bliss.